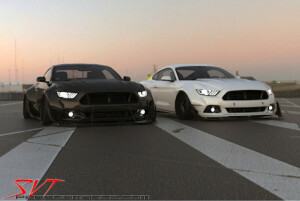 The folks over at Ultimate Bad Boy have been working on an insane 2015 Mustang offering twin turbos, all wheel drive, a wide-body kit, and over a 1,000 HP! Where can I pick up my keys? United Kingdom based company Ultimate Bad Boy (better known as UBB), has been building 1,000 HP Mustang’s since 2008. Company founder and owner, Tim Porter, drove a tuned and worked 2007 Mustang and was left wanting more so he decided to build his own 2008 that topped the power charts at 1,000 HP. In the following years, UBB has put out different iterations of the same package for 2011+ Mustangs, and now they have their eyes locked on the 2015 Mustang. 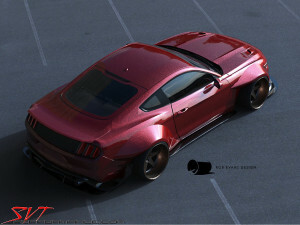 Originally reported by SVTPerformance.com, UBB’s 2015 Mustang will be offered as the “RS1000” and will feature a 1,000 HP, twin turbos, all-wheel-drive, and a wide-body that will absolutely demolish anything around. They will also offer a “RS900” version that will come with a standard body style. The 2015 UBB Mustang utilizes a low-compression 5.0L that has been beefed up with forged parts, which helps to support the twin 67mm ball-bearing turbos mounted to the engine. Hellion’s Eliminator Twin Turbo System is able to crank up the boost and deliver large amounts of power almost effortlessly. UBB has also chosen to use custom ground camshafts that will give their boosted 5.0L an 8,000 RPM redline, which is right up there in the 2015 Shelby GT350 territory. With that high of a redline, the engine will be much safer and be able to handle the huge increase in power. Drivetrain – AWD Mustang, you say? While some people may not be phased by the high horsepower figures of the 2015 RS1000 Mustang from UBB (do you even have a pulse? ), the one thing that has everyone’s interest is the all-wheel-drive system. Channeling the 1,000 HP from the engine through a 6-speed sequential gearbox, the power will than be divided up with 60% heading to the rear wheels and the remaining 40% to the front. 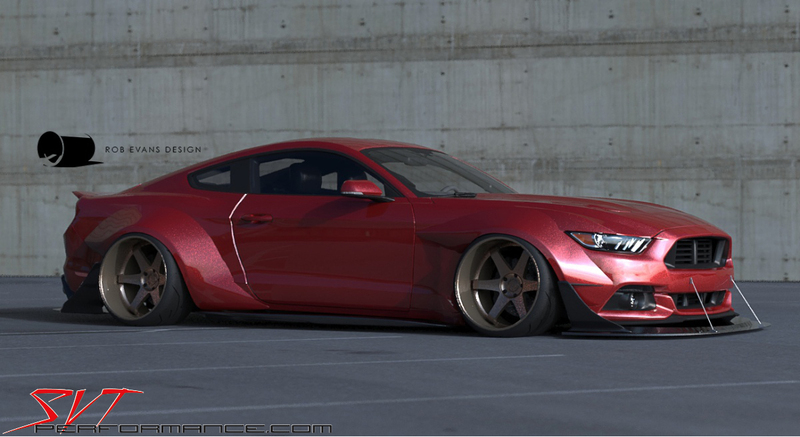 Another one of the huge features of the UBB RS1000 S550 Mustang is the optional wide-body kit. Thew RS1000 with a wide-body will be UBB’s flagship model, while a more conservative (in appearances) RS900 will be offered with a factory body style. While the Rs1000’s wide-body kit does have S550 hugging the pavement with not a lot of clearance, the front splitter will have a quick release system making street driving a breeze. The front splitter can be reattached within 5 minutes, making driving to the track, racing, and driving home a hassle-free experience. How Much Will The UBB 2015 Mustang Cost? With such a wide assortment of incredible features and options, let alone the jaw dropping performance figures, you’d assume a package like this would be well into the mid-six figure range. However, UBB plans to offer the RS900 (non-wide-body version) starting at $115,000. There has been no word as to what the RS1000 will cost, yet one can reason that it should be in the same ball park as the RS900. With that kind of performance at that price, you get a lot of bang for your buck. What are your thoughts on the RS1000? Is this a Mustang you’d like to Thrash or would you pass over this for a Shelby GT350? WOW,i would love to own this 1,000 hp car ! Can it be purchased in the U.S.A. ? Please reach out for me if you have interest in purchasing a UBB in the US. Hi James. You can call or text me direct. 317-874-7786. Thank you for your inquiry and comments. I can certainly appreciate what they have done here, but the paint job isn’t going to last very long if you drive it on the street or even at the track. The front wheels are going to throw rocks and debris down the side of the vehicle everytime you drive it. “The front wheels are going to throw rocks and debris down the side of the vehicle everytime you drive it”…if you keep the car on the blacktop rather than on the shoulder/wall you should have no problem. Maybe you live in a land where they clean all of the streets daily and they are free of any debris. I live in the Midwest and this is simply not the case. American Muscle sells rock guards for the front rocker panel of these cars with the normal design. Anything that gets caught in the tread of the front tire and flies out when the tire rotates is going to hit something. Most likely the car since it’s right behind the tire. YES! BRING IT ON! Will it be 50 State Legal in America?….and can I get it in Automatic?….I am Handicap but I can still Drive! Please reach out for me if you are interested in a UBB in the USA. Thanks. Yes Andrew, Thank you for your response. I am a friend of Tim Porter and I’ve already made contact with him. God Bless and thanks Again. Perfect. Please let me know if I can be of any assistance.